I’ve been dying to share this recipe ever since we got back from Hawaii a couple months ago — there seems to be a poke bowl (pronounced “poh-ké”) on the menu at just about every restaurant in Maui, and since I sampled so many of them throughout the trip, it took me a little while to pull together all my inspiration and create something that lived up to my memories. 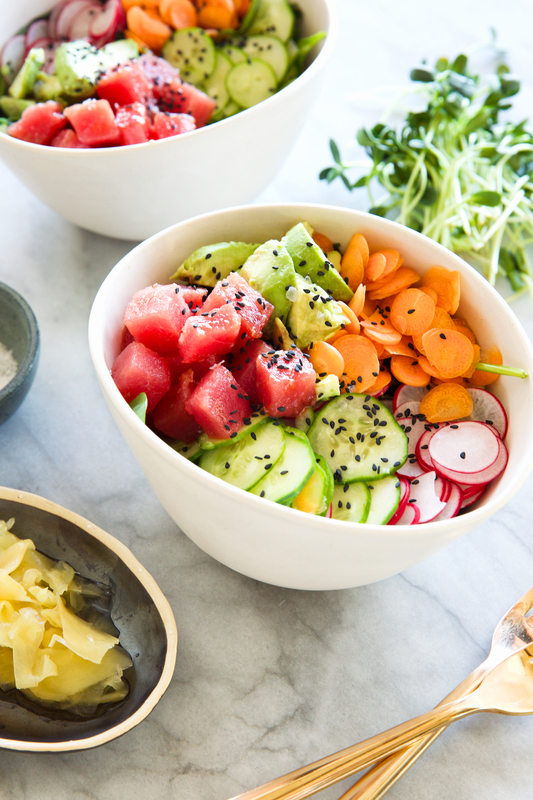 Poke bowls have been part of the Hawaiian culinary tradition for centuries, but I only recently discovered them since they’ve suddenly caught on as a trend-of-the-moment in LA and NYC. 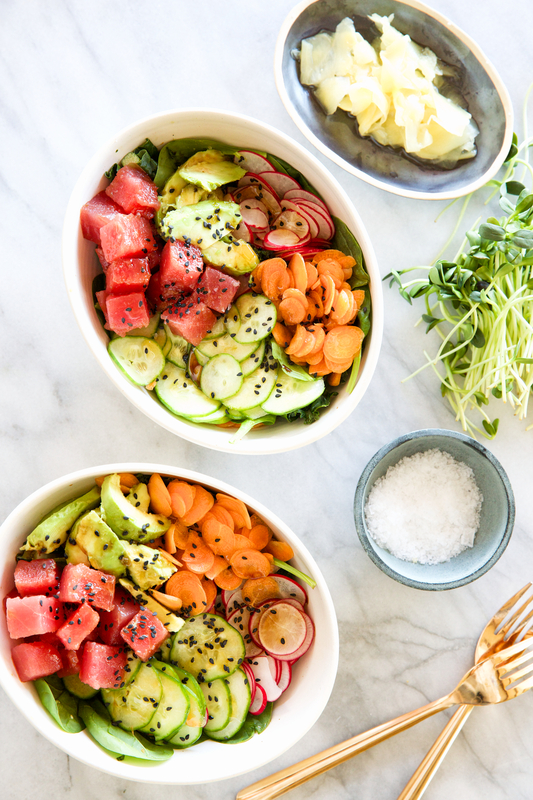 Like many of the dishes I loved while we were in Hawaii, poke bowls are all about showcasing the gorgeous and colorful vegetables and freshly caught fish that abound on the islands. From the high-end restaurants to the casual roadside stands, I was blown away by the freshness of the ingredients everywhere we went on Maui — and it was all arranged so beautifully that each dish feel like a culinary work of art. I think the most interesting version was the one we tried at Spago: the poke “cone” mixed ahi with chili aioli, bonito, green onions, and pickled ginger for what was truly the perfect bite. Thanks to the abundance of beautiful fresh fish on the islands, Hawaiians have been making poke for centuries — chopping up raw, just-caught seafood and mixing it with flavorful ingredients to create something magical. I found out that even though poke currently feels trendy on the mainland, most Hawaiians grew up eating it prepared casually at tailgates, diners, and on the table at home. That’s what made it so interesting to see how chefs in Maui translated poke for high-end menus, sometimes using sea urchin and snapper, and mixing in sophisticated ingredients like avocado salsa and wasabi aioli that create more fusion-style dishes. The best way to describe a poke bowl to the uninitiated? Picture a sushi roll, deconstructed so that all the flavors can shine on their own. Basically, my idea of heaven. 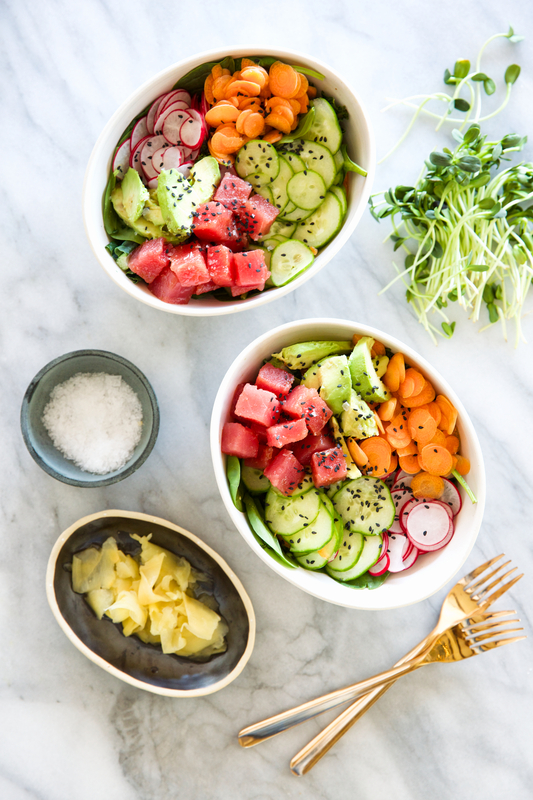 When I got home and started experimenting, I learned that the best part of a poke bowl is that it’s a true canvas to use your own creativity, topping them with whatever flavors you love and are seasonal in your area. Start with a bed of greens or short grained rice tossed with rice vinegar. Next, choose your fish: usually a fatty fish like tuna or salmon is used, and purchase it somewhere that can guarantee extreme freshness (I usually look for tuna that’s been frozen and labeled “sushi-grade” since it’s served raw here.) I pop the thawed fish in the freezer for 5 minutes before cutting it into cubes, making it much easier to slice. 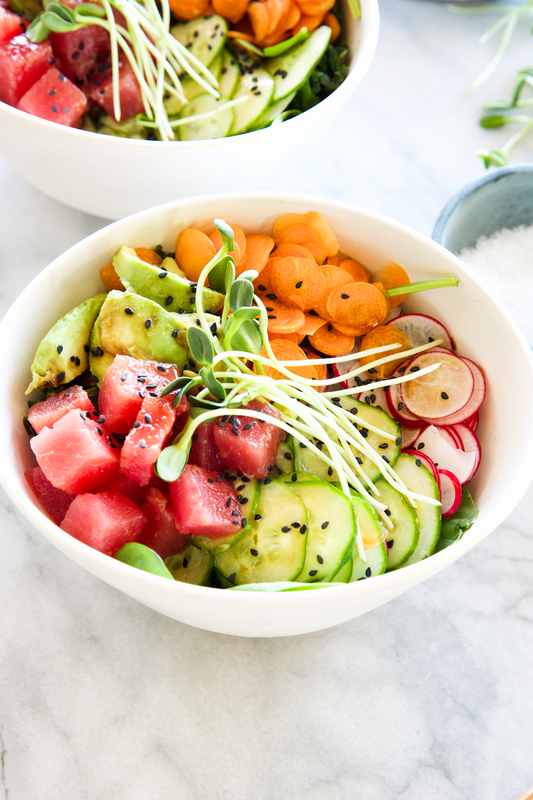 The final step is adding all your garnishes — raw veggies, herbs, sesame seeds, seaweed, avocado, and spicy ginger — this is the time to get creative! Aim for a mix of textures and flavors, arrange them beautifully, and tie it all together with a simple spicy-sweet marinade poured over the top. Keep reading for the recipe, and I’d love to hear what you think if you decide to give it a try. Our time in Maui made for such an incredible week: we rode bikes to see the black lava formations, took a helicopter ride around the islands, ate incredible food, and almost got used to breathing in the fragrance of jasmine and eucalyptus everywhere we went. Pure magic. If any of y’all have visited Hawaii and have a favorite poke bowl spot or another culinary highlight, please share — I’m already dreaming of my return trip and can’t wait to sample some new dishes! Chill bowls that you'll be using in the freezer for 10 minutes before assembly. Keep cubed tuna and cubed avocado in the fridge until it's time to assemble so they stay very cold. Make the dressing: Combine zest, juice, sugar, and 2 tablespoons water in a saucepan. Bring to a boil and remove from heat. When cool, whisk in soy sauce, vinegar, and ginger. Toss spinach with a bit of the dressing, then divide between chilled bowls (or cooked rice.) Toss tuna with a bit of dressing. Arrange tuna, cucumber, radishes, carrots, and avocado in a pattern over spinach. Drizzle with remainder of dressing, then top with microgreens and sesame seeds. Eat! Sounds so refreshing and healthy, especially with all the heavy winter fare we typically eat this time of year. Did you encounter any bowls with pineapple or other fruits when you were in Hawaii? These look AMAZING. I feel like I’ve gotten into a bit of a winter food rut…this looks like just the ticket I need to experiment with something new. This looks so vibrant and fresh! Will have to give this one a go. It’s spelled poke. No second e, no accent mark. Hi Camille! Where do you usually go to buy your ahi tuna? I live in Houston and would love to start making this but I’m unsure where to get the fish for it. Cheers! Hi Laura! I get it from both Central Market and Whole Foods — it’s found in either the fish department or the frozen food aisle and marked as “sushi grade ahi tuna” or “sushi grade yellowfin tuna.” Ask someone who works in the store and I’m sure they’ll point you in the right direction!